My desire to learn to cook Jjajangmyeon actually came from a K-drama I watched awhile ago. One of the characters owned a Chinese restaurant in Seoul that was famous for fast and delicious jjajangmyeon, and it looked so tasty. Prior to this experiment, I had never had this dish before; and when my fiance and I eat Korean food, it’s generally BBQ. I didn’t trust finding a restaurant that made it well, so I resorted to the internet, and my new favorite Korean blog, Maangchi. I recently started cooking Korean food. To be honest, this is a whole new world for me in the realm of cooking, just like Hawaiian food is. Japanese food I learned from my host mothers, Chinese food I learned working in a Chinese restaurant, Filipino food I learned from my best friend, but Korean food I’ve only seen made in dramas. As a result, cooking it on my own is 100% an experiment. Luckily, I have the trusty internet. High Quality Meat Options – The menu consisted of predominately an above average meat selection. 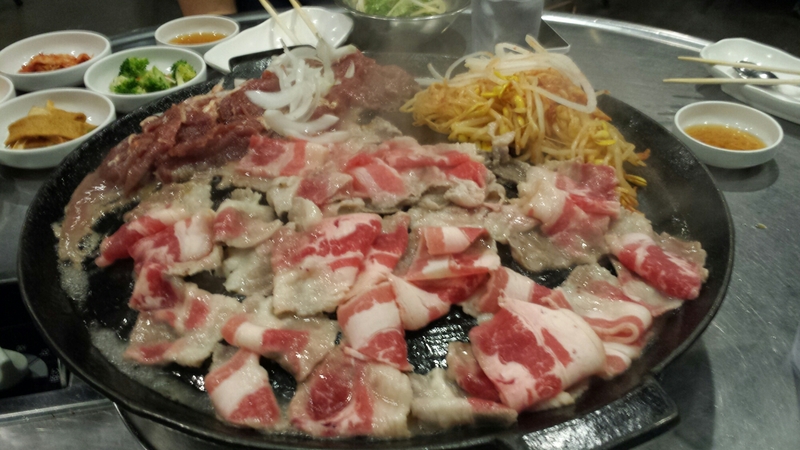 We had the delicious beef bulgogi, beef brisket, and pork neck. The one thing I do not recommend here is the beef tongue, as they don’t trim the outside off the tongue. Excellent Lunch Specials (These are only M-F during specific times of day) – The most high value options on the menu; this is a set meal including meat and sides. Atmosphere – This could be either a pro or con depending on the person, but Honey Pig’s atmosphere is what you would expect of a good Korean BBQ place. Loud K-Pop plays in the background while you sit at a round, metal table, grill in the center. The smell is intoxicatingly delicious and sticks to the clothes, and the sound of sizzling meat permeates the room. Authenticity – This is genuine Korean food in all it’s spicy, sweet, garlicy goodness. It’s served with many sides, including my favorites, pickled Daikon and steamed egg (which is heavenly here). Lettuce leaves and kimchi are also already on the table, but you do need to ask for the miso paste. The servers cook – This is another personal preference issue. I like to caramelize my meat and cook it in small batches, but at HP they don’t even leave tongs for you at the table. The servers do all the cooking, even to the point of actually serving you from the grill. I ended up throwing a few pieces back on the grill with my chopsticks to get more color before finally eating them. Service – The servers are kind and it’s relatively average service for a Korean place. However, A server knocked our kimchi plate off the table, practically into my lap. Not only did they not bring us more kimchi after that (much to the dismay of my fiance), but they didn’t even wipe up the mess beyond picking up the plate and a few scraps of cabbage. I had to step around the gochijang-smeared floor on my way out. Sunday I had the privilege of celebrating the birthday of my best friend with a foodie fest in Bethesda Row. We ate our way through the day in the most glorious and gluttonous food binge of the last year. From this wonderful day, I have two reviews for you all to enjoy! Mussel Bar has been a favorite brunch spot of mine since my friend (the same person whose birthday we were celebrating) took me there one fateful Sunday a couple years ago. I don’t go often because it is, after all, mussels and oysters, and therefore exorbitantly expensive for a young professional; but I promise you, it is worth every last penny. For this meal, we enjoyed the Bucket o’ Bubbles (which was a delicious Prosecco paired with your choice of combo, in our case Bellini), the White Wine Mussels (We had no cream in ours because of allergies, and it was wonderful. I highly recommend spreading the garlic on bread), Sweet Potato Frites, and Chicken and Waffles (the fried chicken was divine, salty and melt in your mouth with that little bit of *crunch*). I really must apologize for the lack of food pictures here, but I completely forgot to take a single picture before positively decimating every plate the server brought. High Quality Food – You cannot go wrong here. Everything on the menu is imaginative with a hint of that “Mom’s cooking” comfort-food type feel. The proteins are cooked to perfection and the veggies are wonderfully seasoned with the highest quality spices (can you say truffle bechamel and freshly made spicy ketchup?). Excellent Service – My Bellini was absolutely bottomless. Our server was knowledgeable, attentive, and positively delightful to speak with. It’s the perfect balance between letting you eat and making sure you have everything your heart desires. Value – I think that for the price, you are getting a great deal. The food, service, and location are all top-notch for an average $20 per dish on the brunch menu. Dinner will cost you closer to $25 per dish, which is normal for the area. Alcohol Selection – If this is important to you, Mussel Bar is a great choice. There is an excellent selection of craft beers, a long wine list, and our Prosecco was wonderful. Price – Honestly, I don’t consider price a con here. But being the stingy young professional I am, I had to add it. This isn’t your weekly brunch place; it’s definitely a special occasion type of meal. However, like I said in the Pros, the value is there and I think it is worth every penny. Portions – Their portions are definitely European style so don’t expect a feast. For example, the Chicken and Waffles was three palm-size waffles, two drumsticks, and a chicken breast. It’s enough to get 80% full on one dish, but not enough to become stuffed to the gills. The Patio is Narrow – Due to it’s location, the outside patio for Mussel Bar is on the street side of the sidewalk. It’s not really a patio and tends to be cramped, loud, and hot (all that concrete). If you’re looking for a brunch place to eat outside, this probably isn’t the right location. Imaginative and Adventurous Food – Yes, the food is so good you will want to lick your plate; but paired with that deliciousness is an opportunity to try something you’ve probably never eaten before. Unfortunately, I cannot vouch for the authenticity of this Spanish-inspired cuisine (I’ve never been), but I can tell you, it is an experience you will not regret. Cute Servers – The service will range from above average to excellent here, as expected of any high class restaurant, but I have to say, their servers are very attractive (both male and female). The reason I note this is because my girlfriends and I have specifically gone to Jaleo just for the cute waiters, something we’ve never done for any other restaurant. It might be a good location to start a Bachelorette party. Tapas – I love tapas style food, despite the expense, because it gives you the opportunity to try everything. 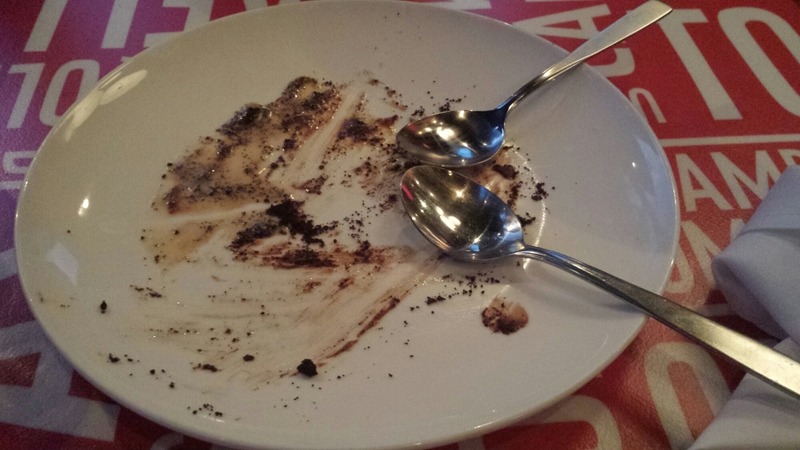 A solid meal is somewhere between 3 and 6 tapas plus dessert (for two people). Imagine ordering your 4 favorite things on the menu and eating it all in one meal! It’s like having a mini potluck in a top notch restaurant. 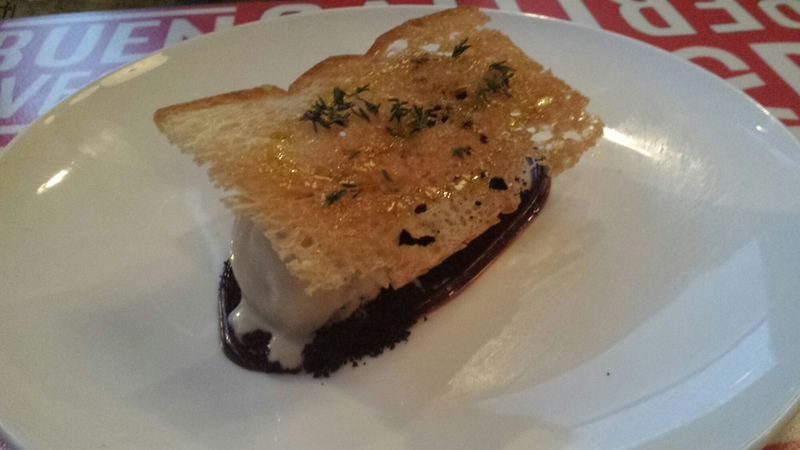 Price – Mussel Bar can be expensive, but Jaleo’s prices are truly up there. Again, I think it’s worth it. 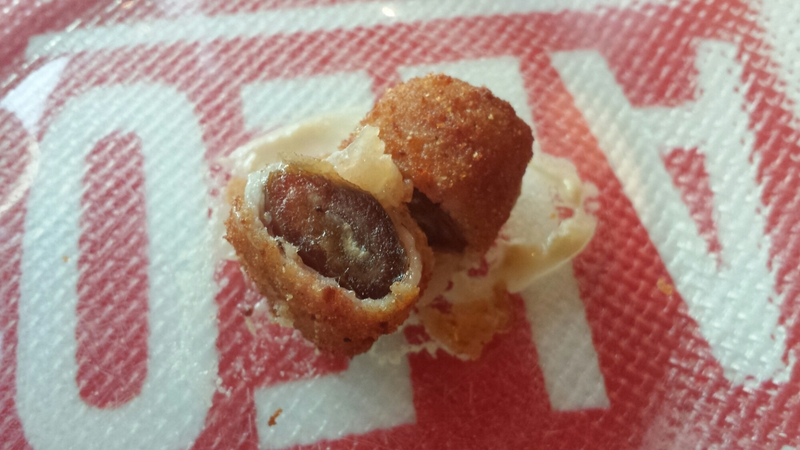 However, it takes so many tapas to fill you up, that you will be looking at around $50 per person. This is that anniversary dinner place you love, but only eat at once a year. One way to cut down on the price is to combine a paella (maybe the Rossejat that we had) with your tapas. The downside is you’ll be full faster, so fewer chances to experiment with new dishes. Patio – Again, the patio suffers from sidewalk syndrome, as does every other restaurant in this particular stretch of Bethesda row. Don’t go here to sit outside, go here for the delicious food. The Dish Names – This is one of those personal issues again; I don’t speak Spanish. 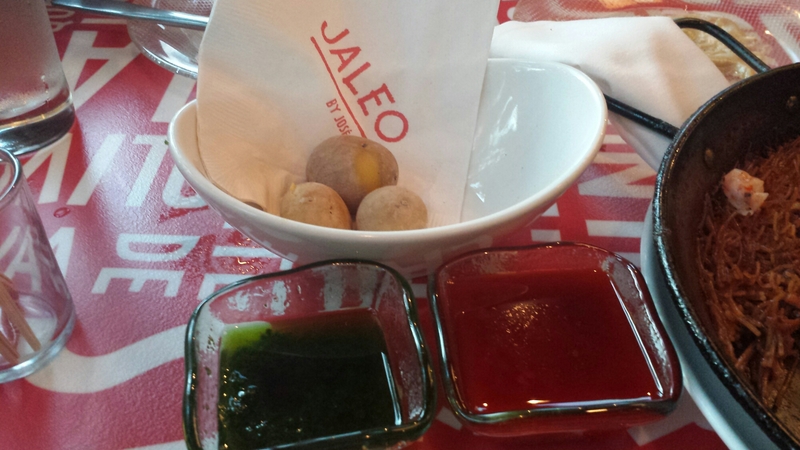 As a result, I can’t pronounce a single dish on the Jaleo menu… not one. This creates an anxiety for me, am I ordering the right dish? Did the waiter(tress) understand me? I’m always worried I will receive something I didn’t order (which wouldn’t be an issue if I didn’t have food allergies). To get around this, I point to the menu when ordering. I may look like a thick-headed amateur, but at least I get the right dish every time.